Actress Shin Min Ah (신민아) attended the SBS Drama Awards where she was awarded 'Drama Special Best Actress', 'Top 10 Star' and 'Best Couple' award with Lee Seung Gi for "My Girlfriend is a Nine-Tailed Fox". 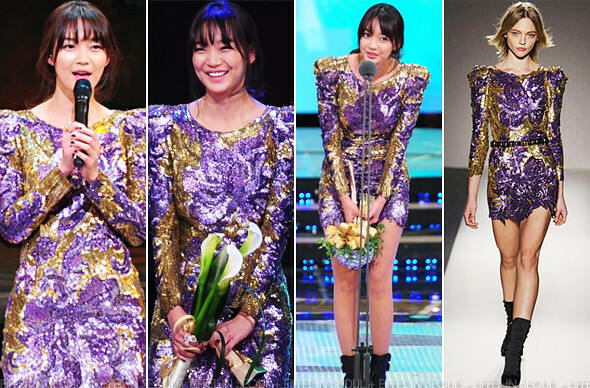 The actress wore a purple-gold embellished dress from Balmain Fall/Winter 2010. Completing her outfit with black boots and a ring. I wished she added a belt to the dress and accessorized her outfit with some jewellery. Overall, I dislike the plain look and her messy hairstyle. I personally would have picked the black-gold embellished dress if it has to be Balmain. The Alexander McQueen dress would have looked better at the award show and the Balmain dress would have suit 2010 Style Icon Awards better.